Scientists learned something crazy about antimatter this morning: it turns out, as far as we can tell, it looks like an exact mirror image of regular matter. But okay, what does that even mean? Physics theory says that every particle has an antiparticle, so for each negatively-charged electron there’s a positively charged positron, and for each positively-charged proton there’s a negatively charged antiproton. If an antiparticle meets its anti-partner, the two particles annihilate each other in a burst of energy. Antiparticles definitely exist. Certain atoms spit out positrons during the natural process of radioactive decay, and the Earth often gets smacked by antiparticles from outside the solar system the form of cosmic rays. 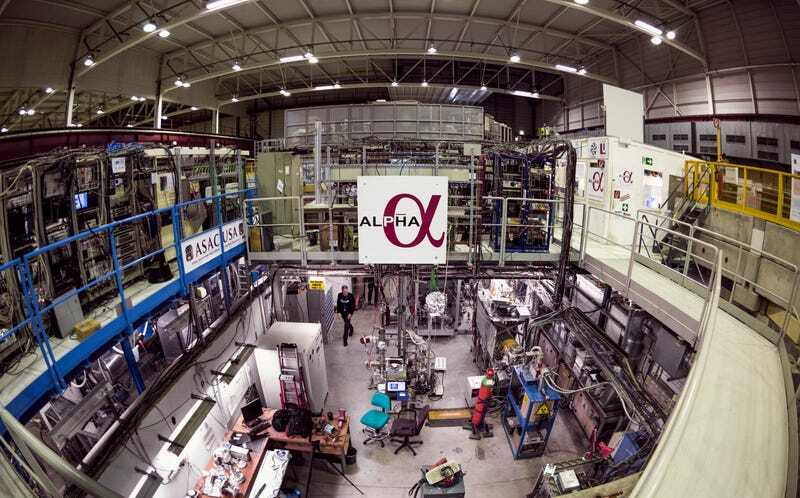 The Antihydrogen Laser Physics Apparatus, or ALPHA experiment at CERN (the lab with the 17-mile-round Large Hadron Collider in Geneva, Switzerland) makes and captures antihydrogen. Antihydrogen is basically the next level of antimatter, a positron orbiting an antiproton, the same way an electron orbits a proton in regular hydrogen. The ALPHA folks captured 14 or so antihydrogen atoms per trial, and blasted them with a laser. The antihydrogen atom absorbed the laser light, then let off a specific colored photon—one of the same particles of light that regular hydrogen atoms would have spit out. The results, which are published today in the journal Nature, represent the very first time physicists have measured a light spectra for antihydrogen. According to Tim Tharp, an Assistant Research Professor at Marquette University in Wisconsin who works on ALPHA, the finding is significant. “It’s long been thought that antimatter is an exact reflection of matter, and we are gathering evidence to show that is indeed true,” he told Gizmodo. If you’re still worried about the whole matter-annihilates-antimatter thing, don’t fret. “The amount of antimatter involved in this experiment and created by the history of mankind is such a small amount that it poses no threat to anyone,” Tharp said. So, you can’t make it into a bomb or a fuel or anything like that.